We’d love your help. 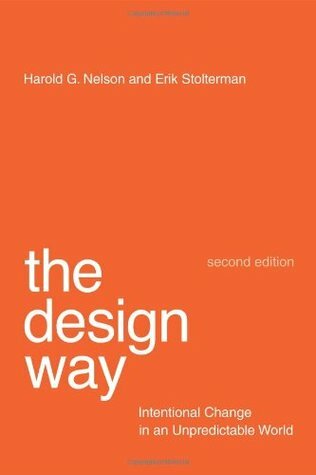 Let us know what’s wrong with this preview of The Design Way by Harold G. Nelson. To ask other readers questions about The Design Way, please sign up. "Judgment making is essential to design. It does not replicate decision making but it is as necessary. The ability to make solid design judgments is often what distinguishes a stellar designer from a mediocre one." - Quoted from chapter 8 of this book. If you like philosophising about design, inventing truckloads of fanciful jargon to describe your baseless generalisations, and finally coming up with conclusions that everyone else already knew, then this book is for you. I had this book for my Design Theory course taught by Prof. Erik Stolterman at Indiana University. Amazing read, if you get the gist of schemas and ideas being expressed in the book. I would highly recommend this book for designers interested in application of design thinking in other disciplines like business, pedagogy, art and architecture. Shoot me an email if you have any comments and/or recommendations about the book. I might drop by Erik's (Stolterman's) office for his thoughts :). Not sure that I really bought all the arguments or found them particularly enlightening. I think one thing that would have helped was more concrete examples, as it's clear the authors have experiences they're referring to but by refusing to get too specific make it difficult to know for sure you're translating their arguments correctly. Still, there are a few gems in the book. Deeply probes the practice of design. To the mature designer a truly accurate codification of the design experience... For everyone else probably a bit academic. Still, an illuminating book that deeply explains design. An inspiring, very clever, intense bit of research on design the design process from a variety of perspectives. Designers who like to think as well as make will enjoy it.